The bell pepper is a fruit that is familiar to most people, as they are widely-used in cuisines all across the world. According to WHFoods.com, it belongs to the same family as the chili pepper and cayenne pepper. Named so for its unique, block-like shape, It is one of the most colorful ingredients, most commonly green, though red, yellow, and orange bell peppers can also be easily found. There are also purple, brown, and black varieties, though these are less common. The bell pepper was originally cultivated in South and Central America, before being transported to Europe. Today, it is grown all around the world, with China as the largest producer, followed by Mexico, and the United States. In the U.S., bell pepper largely comes from California and Florida. When choosing bell peppers, it is important to select those with vivid colors, with a skin that’s free of spots, wrinkles, or blemishes. The stems should be green, and the peppers themselves should feel heavy for their size. They should be firm to the touch, and not mushy. Peppers stored properly in the refrigerator can last up to 10 days. 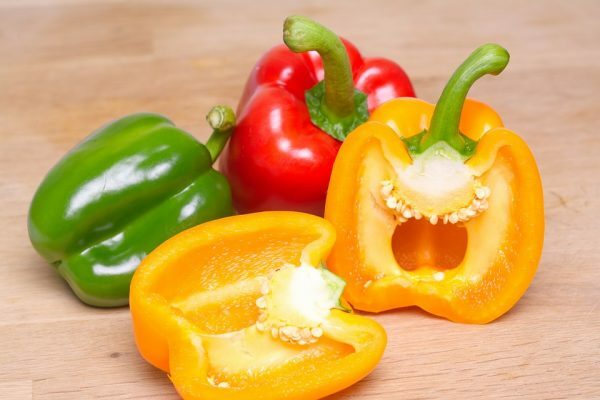 Bell peppers have a rich nutrition profile, containing essential vitamins and minerals, as well as amino acids that boost health in many ways. Fresh bell peppers contain a good amount of vitamin C, with red bell peppers having the highest concentration of the vitamin. As an antioxidant, vitamin C keeps the blood vessels, skin, vital organs, and bones in top condition. The vitamin also effectively prevents infectious diseases and other conditions. Eating bell peppers regularly can also help prevent scurvy, a disease caused by vitamin C deficiency. These peppers also contain a significant level of vitamin A, as well as flavonoids such as beta-carotene and lutein. All together, these make bell peppers a potent antioxidant provider, protecting the body from free radicals that damage cells. This allows bell peppers to prevent undesirable and debilitating health conditions such as premature aging and cancer. At the same time, the capsaicin in bell peppers can be linked to lower triglycerides and LDL cholesterol levels, allowing these peppers to play a role in heart health by preventing high blood pressure and reducing heart attack risk. It is rich in B vitamins, which are responsible for keeping nerve cells healthy and are associated with reduced stroke risk. B vitamins, specifically riboflavin, also boosts energy. Despite being related to notoriously spicy produce, bell peppers actually have a mild, even sweet flavor, making it easy to add in many dishes. They are commonly added to stir-fried dishes, stews, and pastas, according to HuffingtonPost.com. Roasting bell peppers gives them a smoky-sweet flavor that works great in salads. Because of their shape, bell peppers can also be easily stuffed for a delicious and filling meal. 11 Unknown Facts: What Bell Peppers Do for Your Body? Bell peppers boost the immune system. It is rich in vitamin C, making it effective in preventing scurvy. Bell peppers contain antioxidants that protect the body from free radical damage. They can improve prevent heart attacks by lowering LDL cholesterol levels. Bell peppers can also maintain healthy nerves and boost energy.